OPENING AVAILABLE FOR 2019/20 SEASON! WOULD YOU LIKE TO EXPERIENCE THE LIFE OF THE WORKINGS IN A SLED DOG KENNEL? Have you ever thought that you would like to immerse yourself with Sled Dogs for a Winter? I am always looking for interested individuals that would like to come here and joining with me in the conditioning and training of these remarkable dogs. The applicants need no experience as I will work with them to teach them about training, conditioning, nutrition, team make up, equipment and kennel management. Depending on your ability to learn, you could also run a team before your stay is concluded. Applicants would require a Work/Travel Visa for Canada. ​One position still open for 2018/19 season. Please don't hesitate as it is expected this opening will be filled quickly. 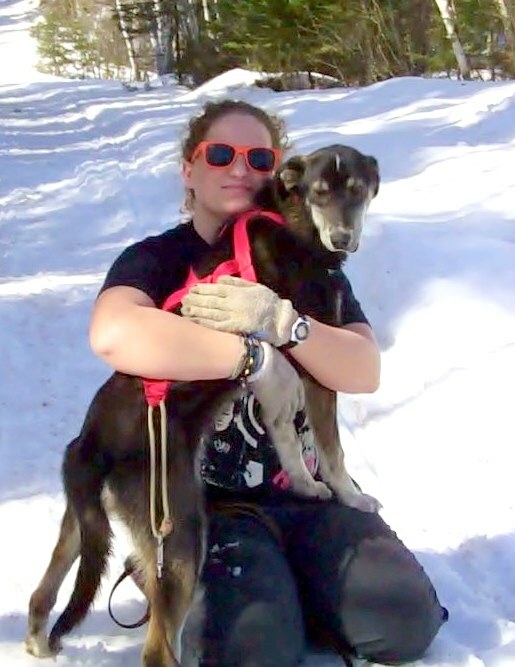 It was a great pleasure to have Alexandra Bihl here last season as a Handler/Trainee at Miortuk Alaskan Husky Kennel. Alex is from Paris, France and had no mushing experience working in an office position in Paris. Coming here last Winter was a very dramatic change in environment and vocation. Alex arrived here the temperature was in the -30's celsius and plenty of snow. 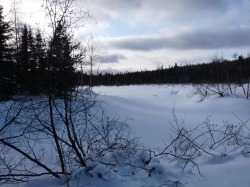 In her first week here, along with the temperatures, she experienced a frozen septic system causing us to have to use a neighbor's chalet for hygienic purposes ( you can guess what I mean) and if that wasn't enough a hydro back out. ​No electric heat nor hot meal. Thankfully we have wood stoves for heat and a hot drink. The hydro problem was rectified after a few hours and the septic system within a week. Here many of the male dogs were as tall as Alex. However, Alex was a real trooper handling everything with no problem and never a complaint. She quickly adapted to her new environment and developed great contact with the dogs and them with her. Alex was a great help here with the training and got to run a team of her own at the end of the season. Alex was also a real pleasure to associate with and we had a lot of laughs and great conversations. Merci Alex for a great time here before continuing your Canadian adventure out in the Western Provinces. You are missed by the dogs and myself. It is with great pleasure to announce that Jack Trigg will be joining the Miortuk Team for this coming season. Jack is from Australia and is enjoying some lifetime adventures in other parts of the world. Jack is a carpenter by trade and his expertise will come in handy here working around the kennel with some repairs and new dog houses. Jack is looking forward to experience life here in the North and the Musher Lifestyle. ​From surfing to mushing, a big contrast! We are looking forward to Jack's arrival here in late September to start this year's conditioning program with the dogs. Kelsey Hawryluk Getting A Little Loving From Roxy! Kelsey is from Winnipeg, Manitoba, Canada and enjoying a brief break from her studies. Kelsey has just graduated and is now a MD and waiting to find out where she will be doing her Residency Training. This was one of her activities on her "Bucket List". It is also a nice change of pace from what she has been used too. ​Welcome aboard the Miortuk Team! Laura Hermes With One Of Her Favorite Dogs,Bergen! Laura is from Germany and enjoying a year here in Canada after graduation from High School and before she enters her studies in University. Laura is contemplating on becoming a Veterinarian. From what I can see here, she would make a good one. "Judith Wundke & Julian Krukenberg Have joined the Miortuk Team"
It is my pleasure to announce that Judith & Julian have joined the Miortuk Team for the months of November, December and January 2016. 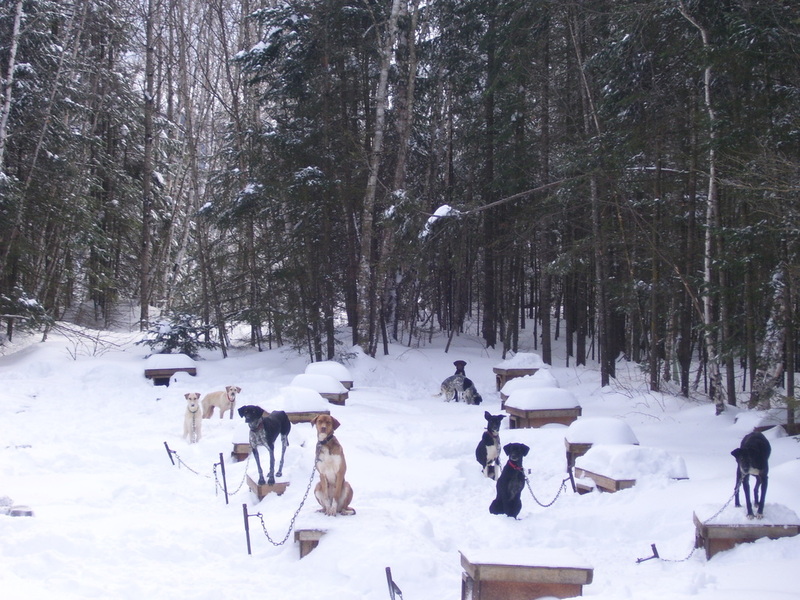 They are travelling Canada for one year and chose Miortuk as their first stop to experience life in a Sled Dog Kennel and enjoy a Winter here in Quebec. They are from Germany and just finished their University Studies. They have adapted quickly to the routines here and are very quick learners. They are a big help and their efforts are greatly appreciated by the dogs and myself. "Taisa Sima Kushner Will be Joining The Miortuk Team In October 2014"
It is my pleasure to announce that Taisa Sima Kushner will be joining the Miortuk Team in the Fall of 2014. Taisa will be spending the season here after completing her studies at St. Olaf College & before continuing Her Academic Studies in University. Taisa, being from Minnesota, really loves Winters & has participated in competitive Nordic Skiing events the past 7 years. A friend of hers handled at a Sled Dog Kennel and after hearing about her experiences, Taisa was enamoured with the possibilities of working with Sled Dogs. She even trained her pet dogs to do Skijoring. It is my hope, that while here, Taisa will be able to compete in some Skijoring Events along with assisting me with the Open Class Team at the races we will be attending. Taisa,welcome aboard the Miortuk Team! Handler/Trainees with Some Of Their Favorite Dogs, 2013/14 Season! "Cecile Hue Has Joined The Miortuk Team For The 2013/14 Season!" It is with great pleasure to announce the addition of Cecile Hue to the Miortuk Team. Cecile is from Bretagne, France. It was her desire to spend a Winter in Canada learning about Sled Dogs. Since Cecile's arrival, we have received over 12" of snow. Welcome to the Miortuk team. "Lauren Hodgkins Will Be Joining The Miortuk Team In October 2013"
It is my pleasure to announce that Lauren Hodgkins will be joining the Miortuk Team for the 2013/14 season. Lauren is from Minnesota & would like to pursue her interest in Dog Mushing. She has attended college majoring in the Culinary Arts. I hope she will like to practice her culinary skills here & I hope she is not too critical of my cooking. HA! HA! Welcome aboard Lauren were in for an exciting Winter racing Sled Dogs. "Julia King Will be joining the Miortuk Team In October 2013"
It is my pleasure to announce that Julia King will be joining the Miortuk Team this Fall. When I asked Julia for a bio that she would like published about her reasons to get involved with sled dogs, she wrote the following: "Throughout my life I have wanted to have about a thousand different hobbies, careers, and college majors, but my single consistent dream has been to mush sled dogs. However, being a born and bred desert rat from Arizona hasn't exactly been helpful in my ability to chase after my dream...that certainly mean I haven't tried though. I built my own dryland sled with scrap wood, metal sheeting, handlebars sawed off of a toddler-sized bike, and a perfect mix of lawnmower and wheelbarrow tires. It was a blast to use with my Australian Shepherds, but it also had no brakes, so we then started bikejoring instead, running laps around my neighborhood during beautiful Arizona sunrises and sunsets. The natural progression of those crazy ideas to chase a crazier dream then led me to Stan Morgan and the Miortuk Kennels. I cannot wait to spend the winter training and mushing real sled dogs, in real snow, on a real sled!". Welcome aboard the Miortuk Team, it is going to be a real pleasure to assist you in pursuing your dream! "LILA PRAT WILL BE JOINING THE MIORTUK TEAM JANUARY 2014"
Lila will be joining the Miortuk Team in January 2014 to learn about mushing & look after the kennel while the team is attending weekend races. Lila has been a veterinary assistant, a dog trainer and a pet food seller but,in her words, "my stronger desire since I'm 14 is to be a musher". "I have read many stories about exciting mushing adventures and I would like to write mine now and the Canadian forest! There's nowhere I'd rather be!" Lila has aspirations of starting her own racing kennel in France after her experience here.
" Michele & Ben with a couple of friends!" "BEN ARMSTRONG WILL BE JOINING THE MIORTUK TEAM FOR THE 2012/2013 SEASON!" Ben will be joining the Miortuk Team for next season to fulfill his interest to experience mushing & the Canadian North in the Winter. Ben is still serving his third term in the British Army. He is an accomplished Diver & is interested in photography. I certainly hope he doesn't have to use his dive skills here to rescue the team or me from the frigid waters of Lac Charland! 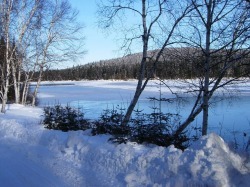 However, he will certainly enjoy his photographic skills here taking in the beauty of the Canadian North in the Winter. Welcome aboard Ben & look forward to seeing you September 2013! "MICHELE VASQUEZ WILL BE JOINING THE MIORTUK TEAM FOR THE 2012/2013 SEASON!" Michele will be joining the team for this season to fulfill her dream of working with Sled Dogs. Michele grew up in Minnesota, where she spent a lot of her time Camping and Hiking. She worked at the Minnesota zoo for 3 years which fueled her love of Zoology. Michele then went to college at the university of Minnesota Duluth to study biology and spent some time in the Air force reserves. After that she married and moved to North Carolina. "When I decided I couldn't handle the hot weather any more and I decided to follow my childhood dream of training sled dogs up north." Welcome aboard the Miortuk Team Michele. Charlotte Has Joined The Miortuk Team For The 2011/12 Season. It is my pleasure to announce the arrival of Charlie to the Miortuk Team. Charlie has 3 years experience working withh puppies in England. She will be responsible for the training of the puppies here along with assisting me with the training of the Sprint Team and accompanying me to the races. While here Charlie will also completing some University coarse's.
" KARA HANSEN WILL BE JOINING THE MIORTUK TEAM !" It is with great pleasure to announce that Kara will be joining the Miortuk Team for the 2010/11 Season.
" EARLY WINTER BEFORE THE FREEZE UP!" Here Franziska captures a photo of the river in late November before it freezes over. "PRISTINE PANORAMIC LANDSCAPES IN THE NORTHERN FOREST!" This photo, taken by Robby, is only one example of the beauty to be seen while here.
" IT IS COMMON PLACE TO SEE FOX AROUND THE KENNEL!" 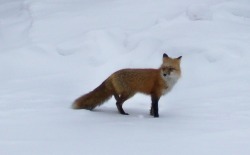 Here a Red Fox keeps a watchful eye on the dogs in the kennel while checking for food scraps.
" AN ERMINE PAYING A QUICK VISIT!" You better have a camera with a quick shutter speed if you hope to catch a photo of an Ermine! Here Fabian caught a photo this visitor in February 2010. 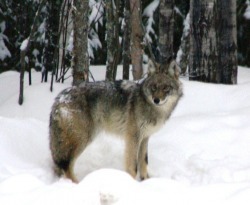 "A WOLF VISITING THE CAMP, WINTER 2008"
Here is a photo, taken by Franziska, of a Wolf visiting the camp. This is only one example of the wild life that can be seen in this area.